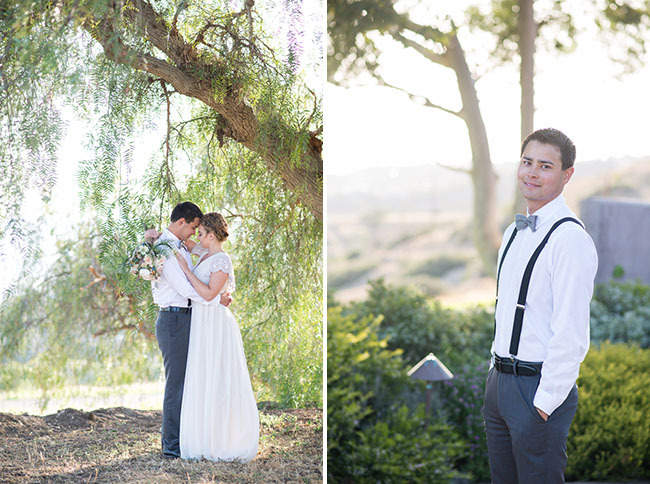 Today’s editorial features the work of two great photographers (Jessica Hickerson + Sincerely, A. 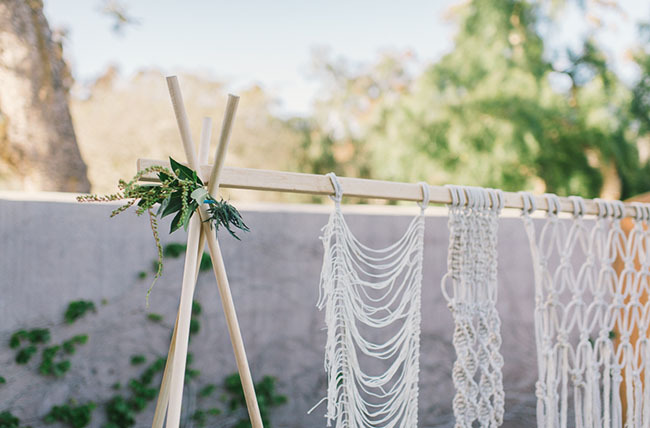 Photography) and a whole lotta bohemian macrame goodness! 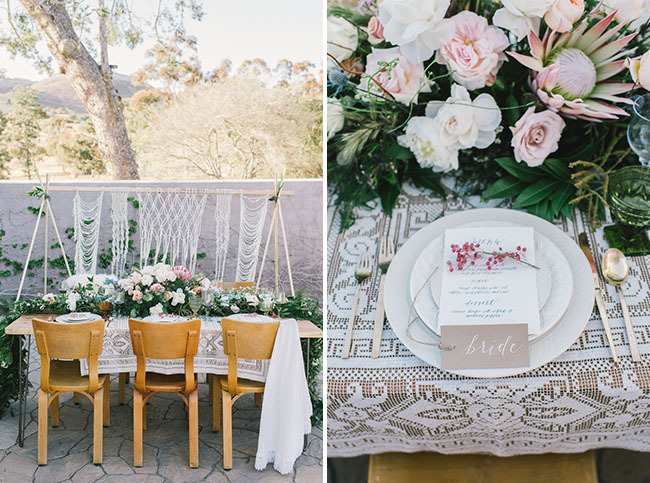 The ladies were totally enamored by the idea of mixing + matching intricate woven textures, and hoped to create a setting that would feel at once whimsical, eclectic and, of course, beautiful, too! 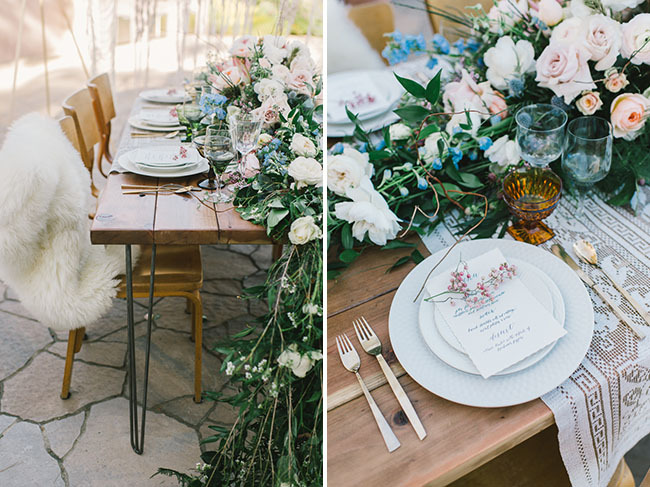 They teamed up with Nicole Alexandra Design for the styling, FlorUnique for the florals and Circa Rentals + Dish Wish for the tabletop pieces + furniture rentals. 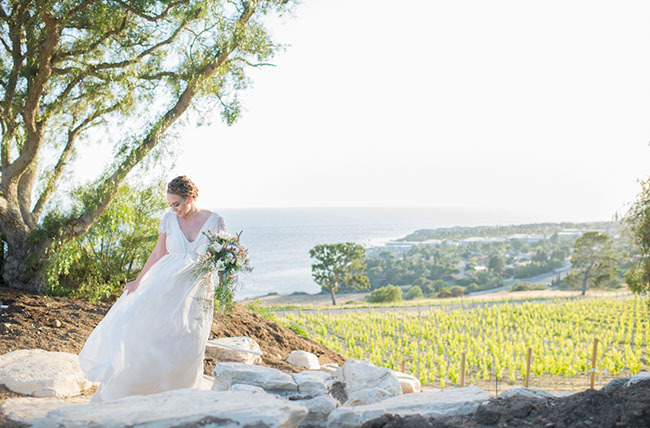 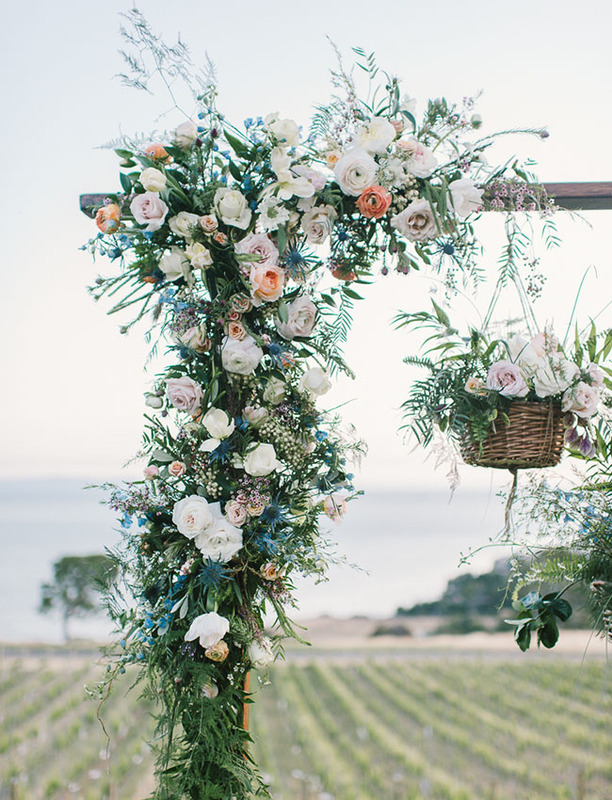 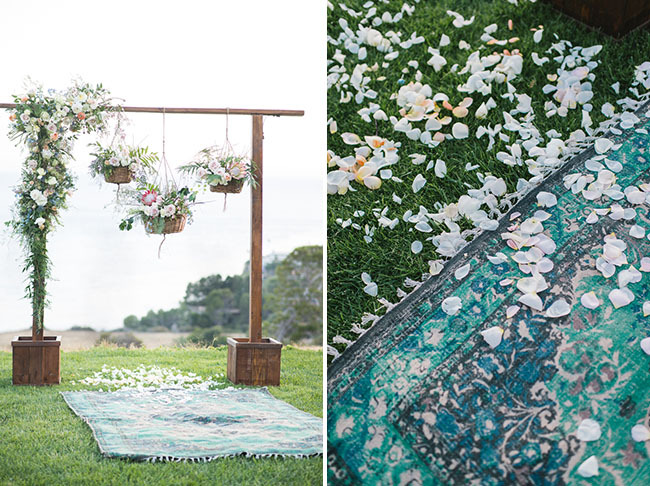 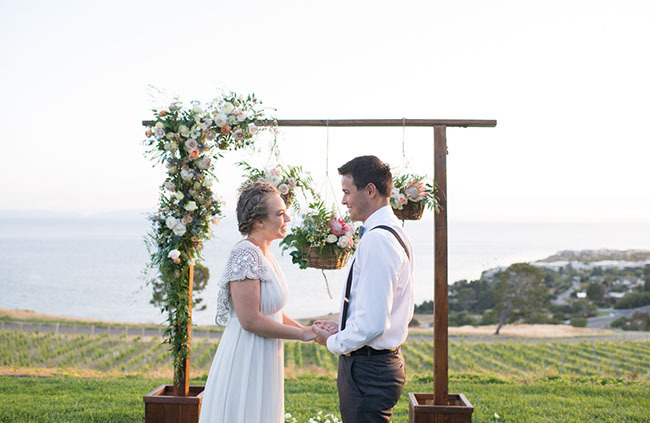 And as you’re about to see in a sec, what these creatives came up with once they got together at Catalina View Gardens in Palos Verdes, California is sure to inspire couples everywhere! 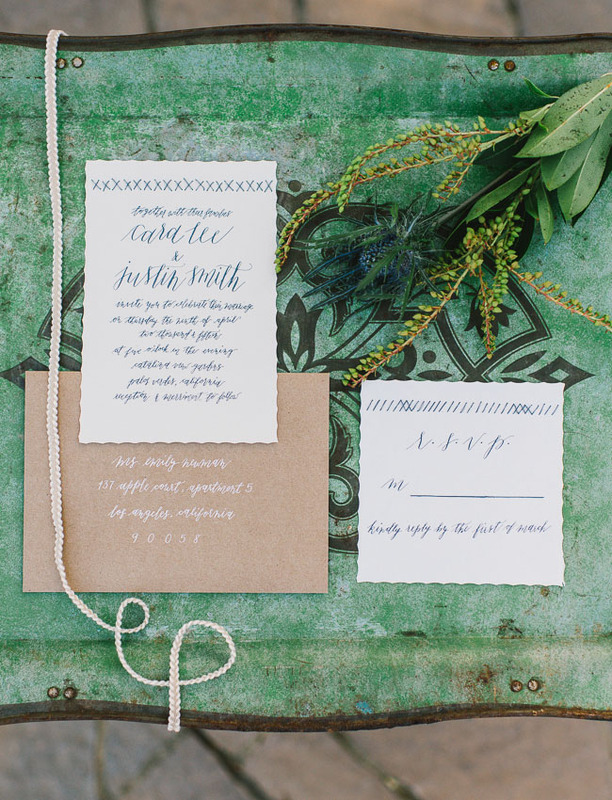 Simple invites, by Allison Gamble, with subtle stitching details made the right first impression for this fun project. 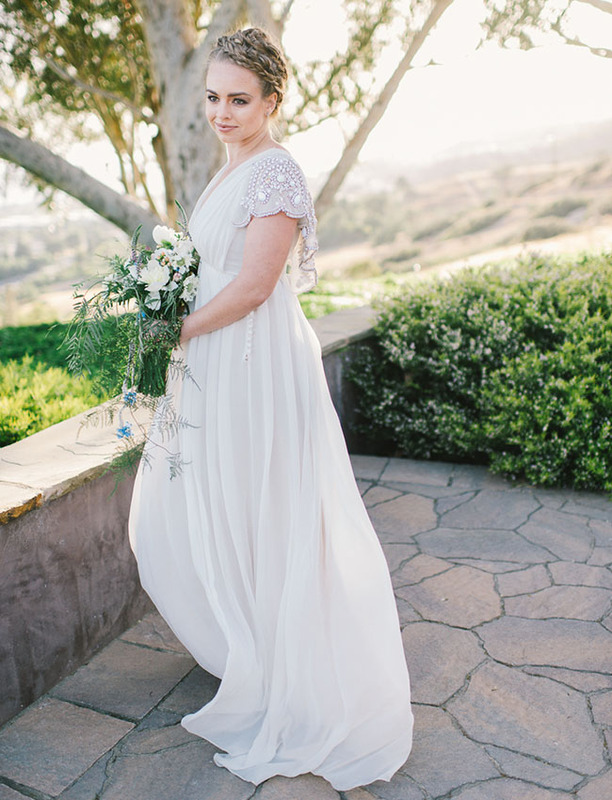 And you may recognize this dress by now. 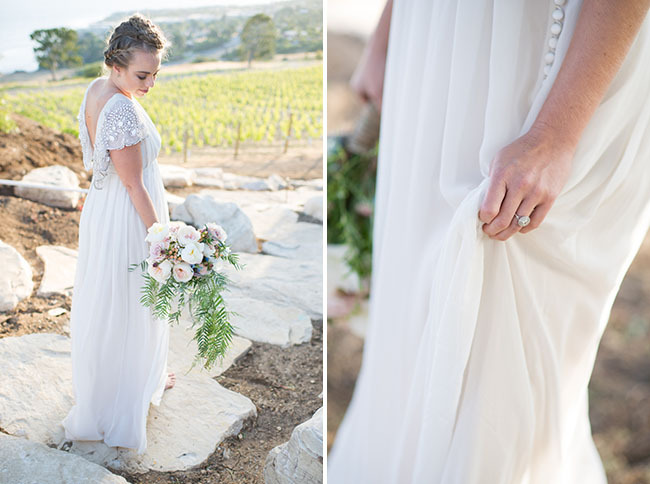 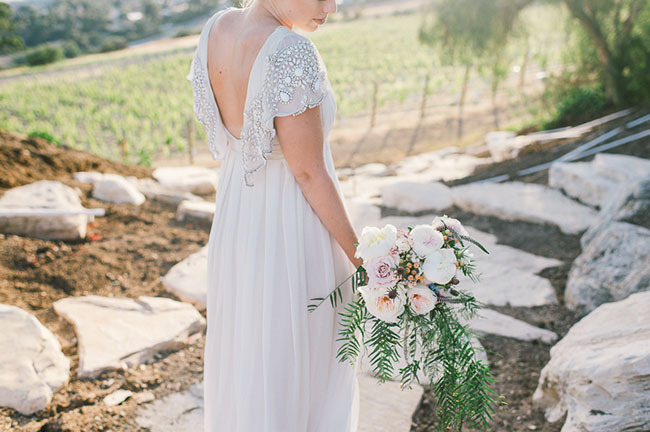 It’s one of our absolute faves by Rue de Seine from Lovely Bride! 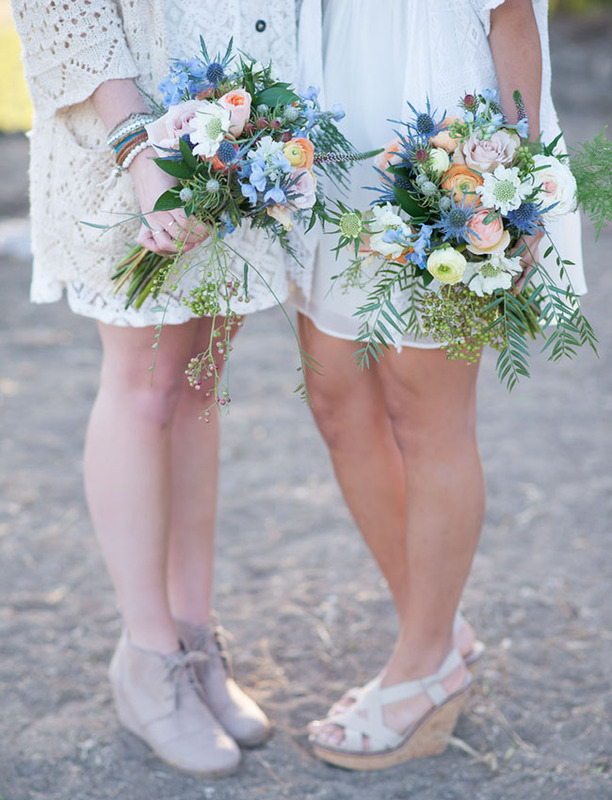 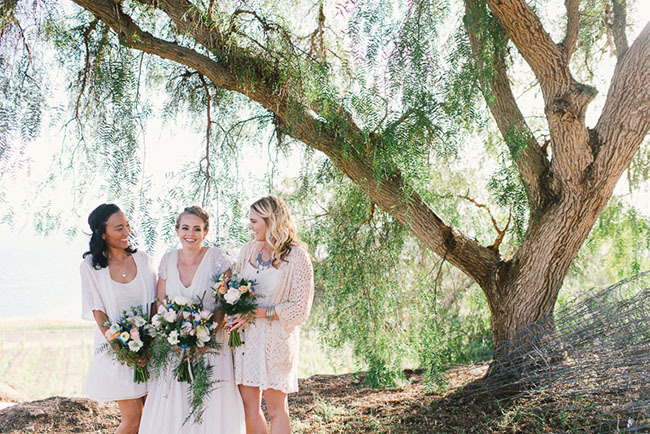 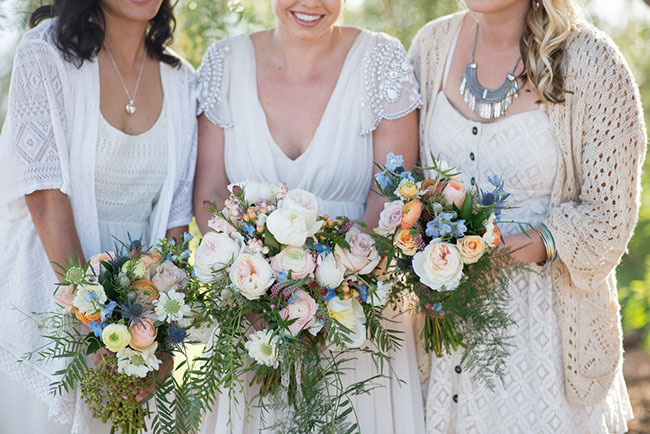 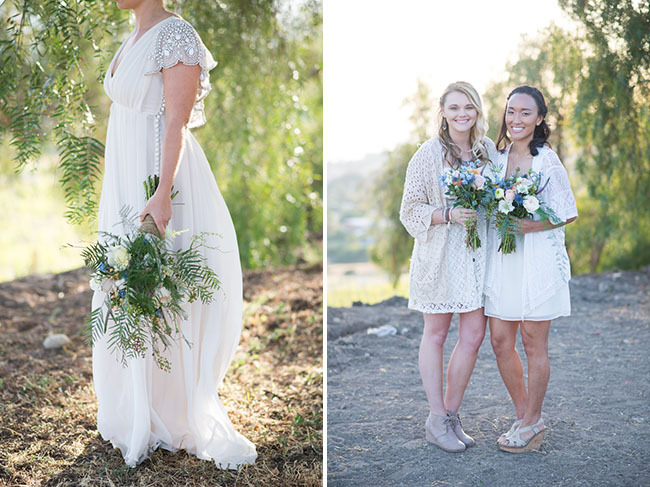 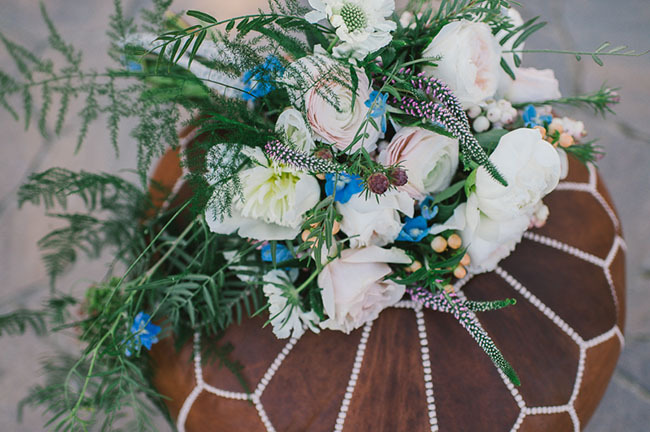 Such pretty wildflower-inspired bouquets! 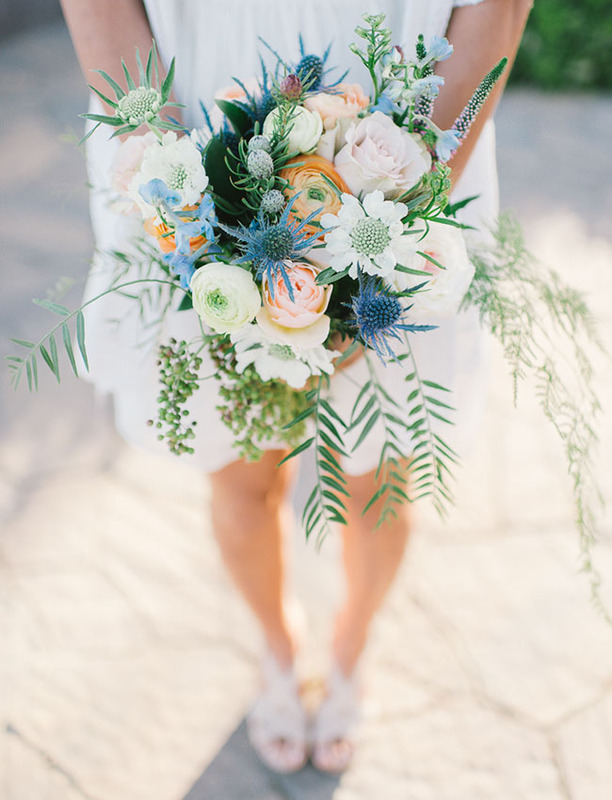 Loving the touches of thistle. 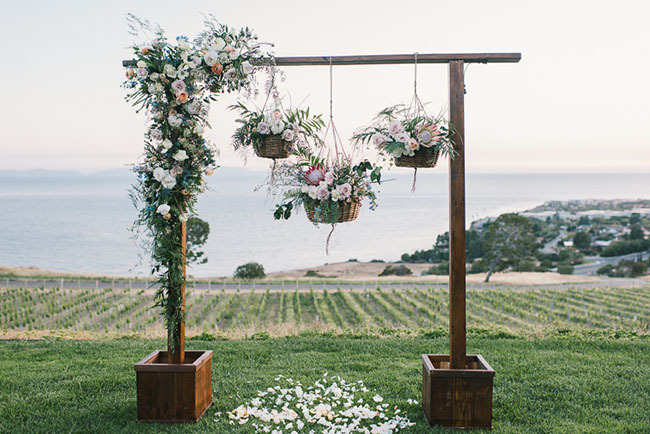 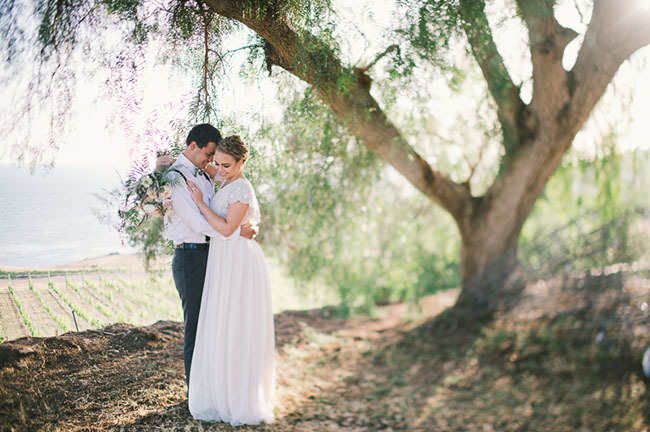 Would this not be the dreamiest spot to exchange your vows? 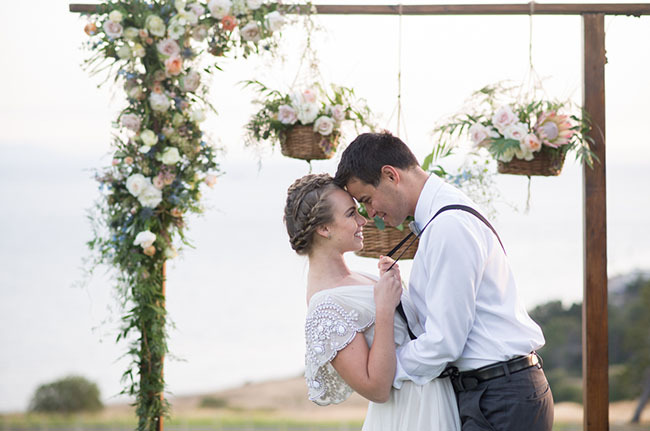 Between the stunning floral arch + that amazing view, we can’t think of a better ceremony spot! 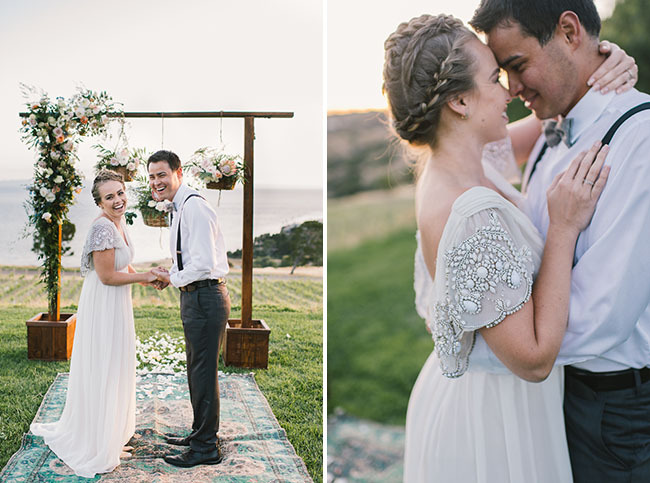 Cute, cute braids by Marcy Villa + pretty, glowing makeup thanks to Cheryl Nacario. 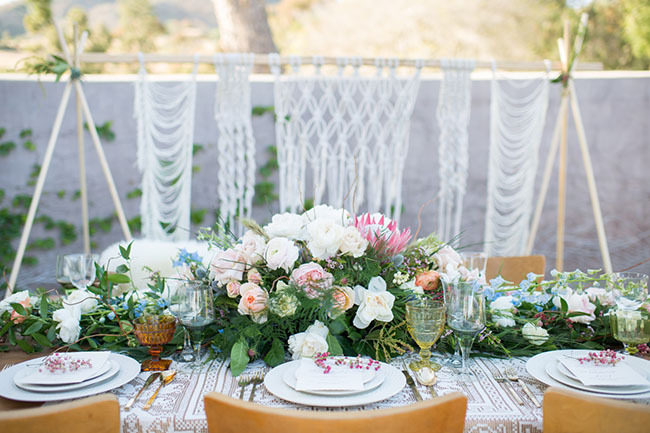 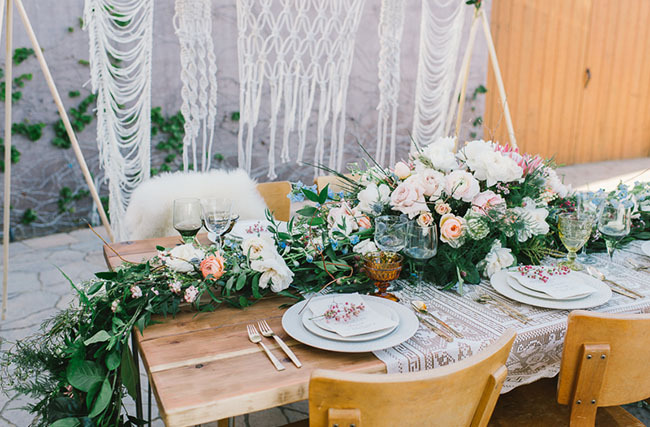 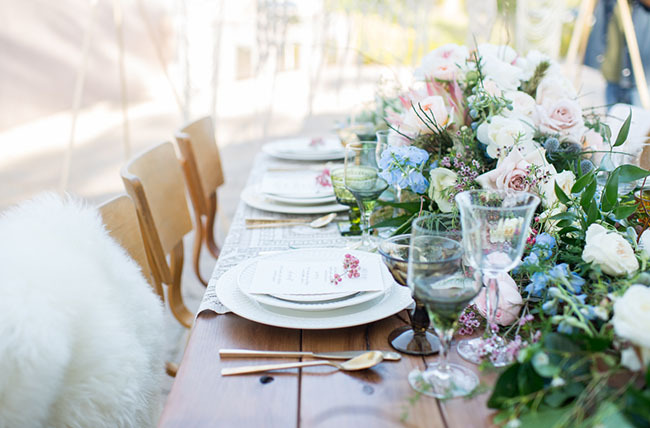 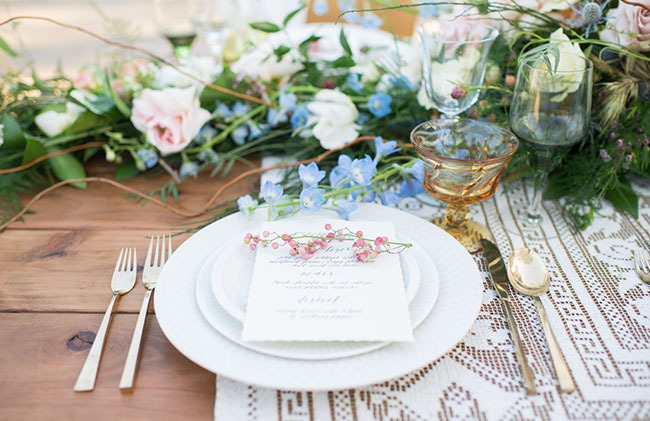 We adore that gorgeous overgrown table runner woven with florals! 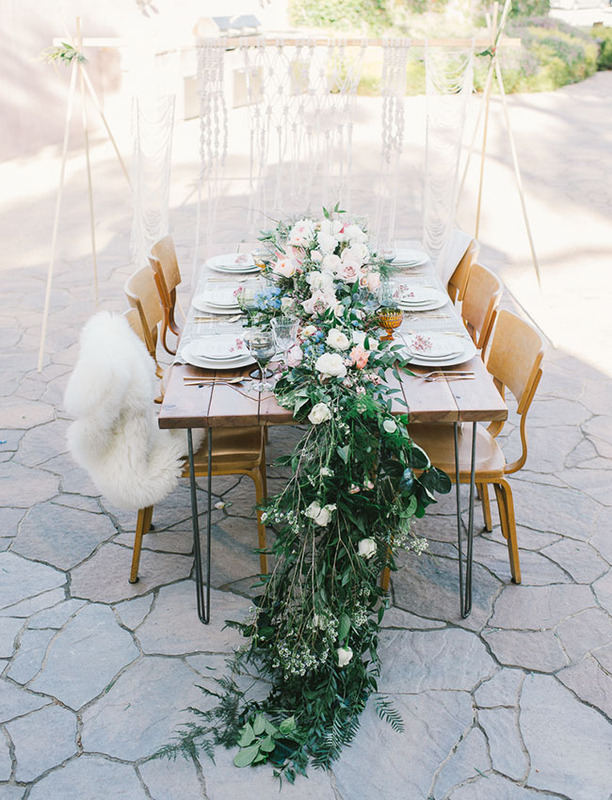 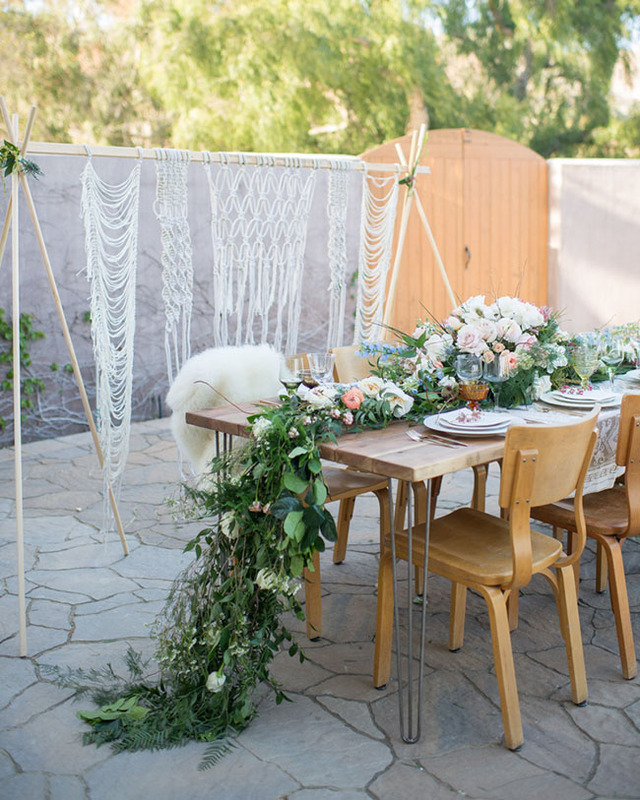 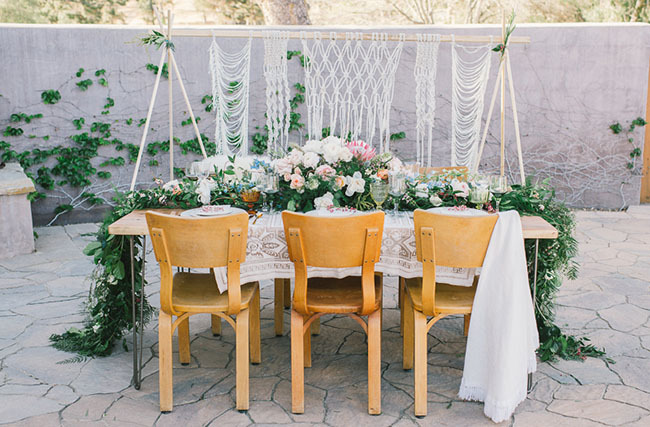 And that macrame backdrop – by Laura Stewart Design – is so, so good! 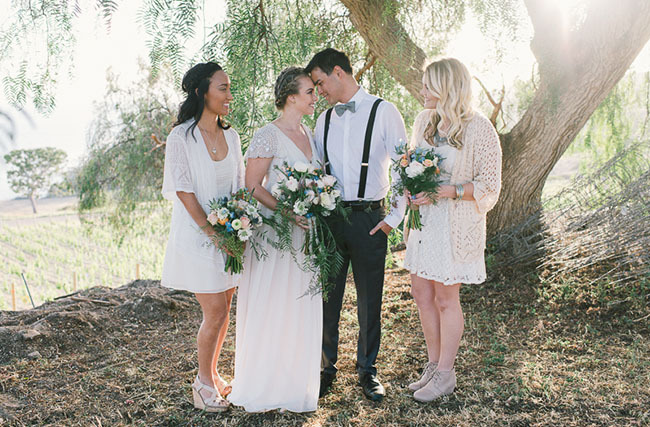 Thanks so much to the team below for inspiring us with their talents today! 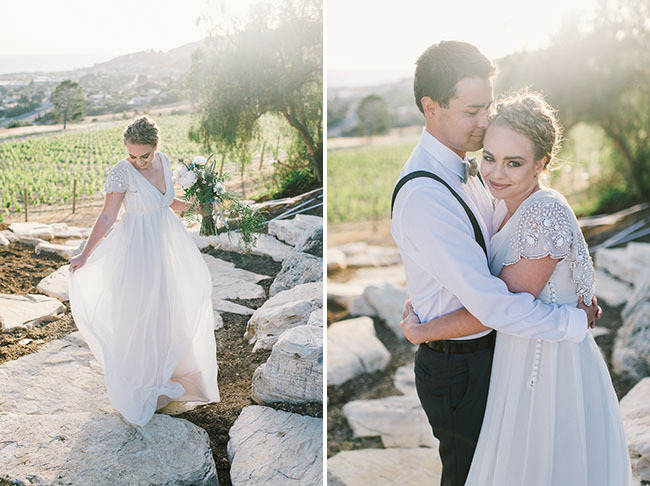 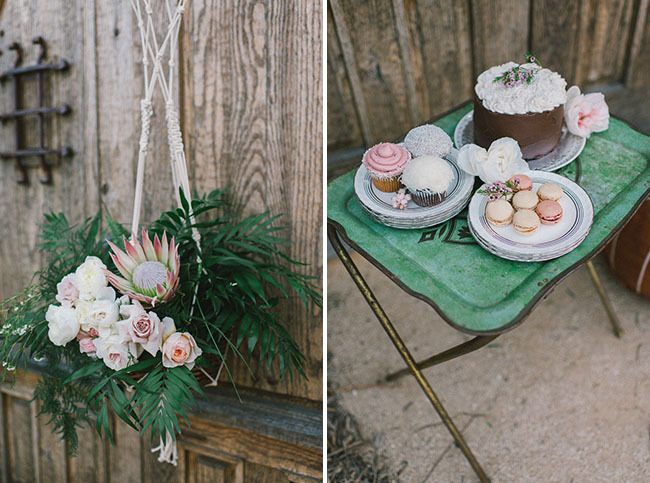 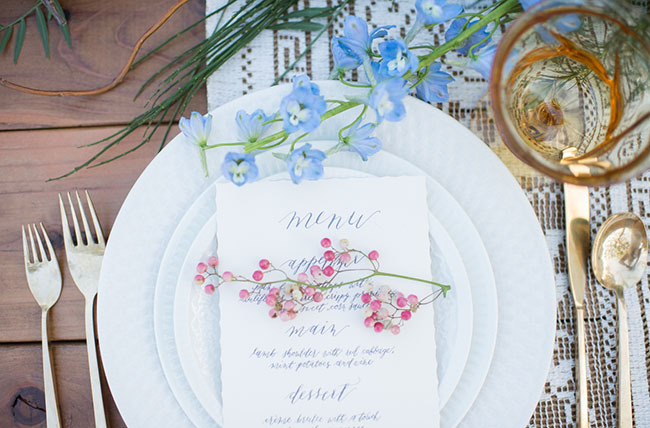 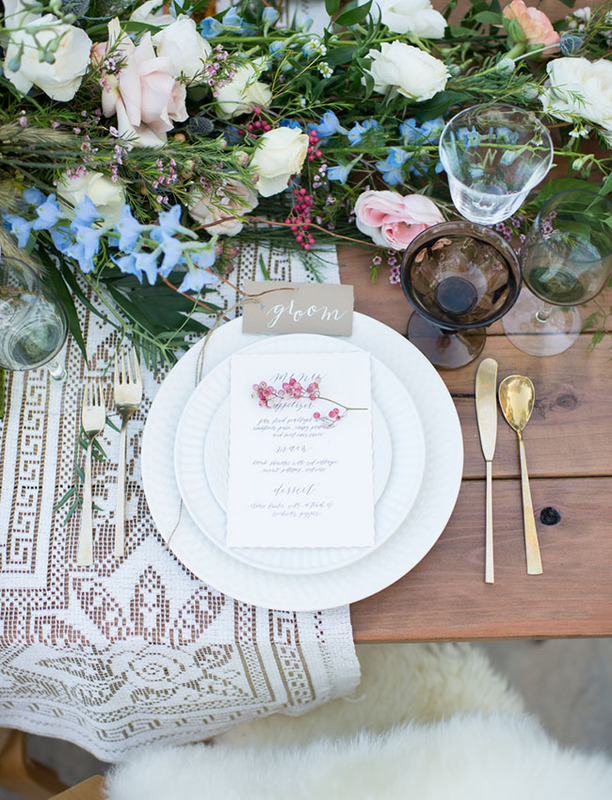 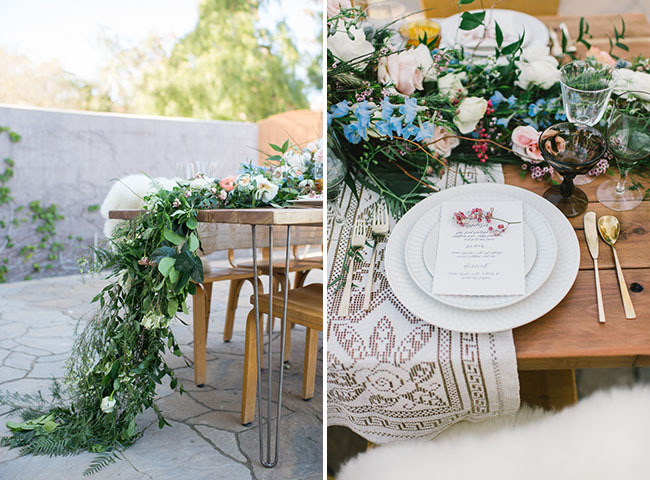 Thank you so much for sharing our “woven” styled shoot, GWS! 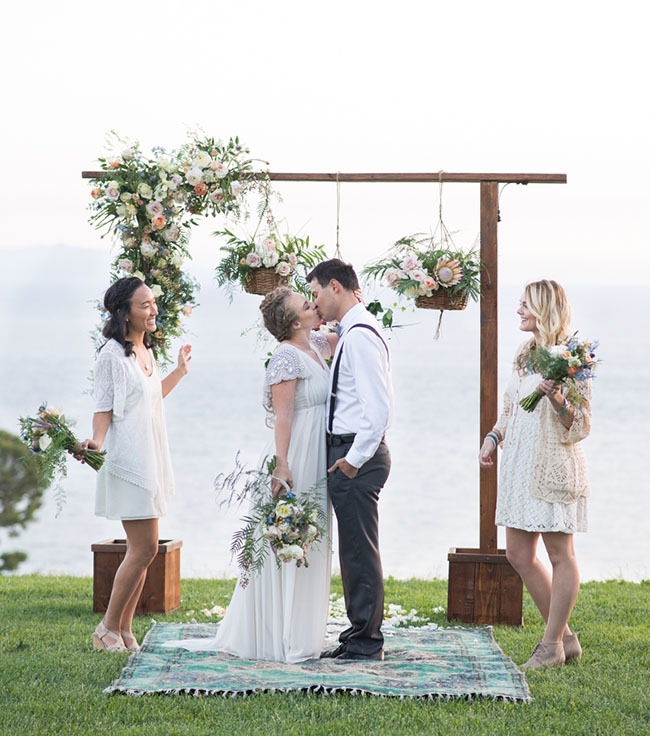 Our team was dreaming of being featured here from the very beginning and we could not be more thrilled!